Well, instead of being nowadays part of the A40, it's actually part of the M40! And when did it become part of the M40? Not long after it opened - in 1970 by the latest! Why did it change its number? Given that I have a map showing the same stretch of road labelled as M40, it's probably down the someone at the Ministry of Transport having a "hang on a minute, that's not really just a bypass built to motorway standards" moment. I'd love to hear from anyone who knows the real reason! You can see the full version of the map shown above here. "I have just consulted my Father who agrees with me that the M40 has always been called the M40. (We have lived in the Wycombe area since 1965). The first section to be built was from Handycross (A404) present junction 4 to Stokenchurch (Junction 5) which opened in 1967. The next section was from Handycross to a temporary terminal at Wycombe End, Holtspur. This bit opened in 1969. I have a 1969 RAC atlas which shows these two sections opened as M40 with junction nos 3-5. Your map shows the present day site of junction 3 at Loudwater as being open together with the temporary terminal at Holtspur (also Junction 3), so I would cast doubt on anything else it represented. As a matter of fact, the temporary terminal was abolished when the Beaconsfield bypass opened to (the re-routed A355) Junction 2, in 1971, The new junction 3 opened in 1972. It was watching the various bits of the M40 being built and then going for a ceremonial first ride on them, which fired my interest in roads and motorways, so I remember the chain of events very well. 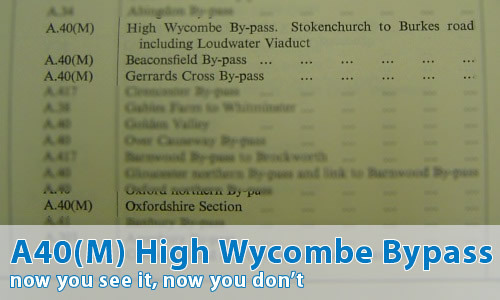 I think that on one page of the AA Members' Handbook of the period (when the High Wycombe by-pass was being extended towards Beaconsfield?) the confusion over the correct nomenclature led to the new(er) bit being shown as "M40(M)" ! (Shades of the A74...). I have to agree with the comments made by Nick and Peter previously. When I came across this page, the following mnemonic came to mind some 38 years after I first created it: A40-M40-A355-A40. I learned to drive during the summer of 1970 while in the US Air Force stationed in England. My first long car ride was from the base I was stationed at in Northamptonshire to London. It must have been in the spring of 1970 that I purchased a copy of the same old map you show on your page. It was sold by book sellers and MAY have been published by Bartholomew. It had a glossy color cover on it. It seemed that map was not very "scholarly" and I shortly thereafter puchased maps from Shell and Esso petrol stations. I was incensed at this, since at the time the petrol stations in the USA were giving away road maps free of charge (as advertising.) The Esso maps seemed to have the fewest errors. Coming from the north, the M40 started at Stokenchurch. There was the usual blue Motorway signage. Shortly thereafter, it passed the old USAF base called RAF High Wycombe. While I am a bit fuzzy about whether or not the route of the A355 was ever changed, I do remember having to take the A355 to get back to the A40 to continue on into London. I do remember that the route of the A355 at one point had a plant along side it of Harris Intertype, the printing equipment manufacturer which became Harris Corporation. I had often wondered why that pricy map showed A40(M). Since that map had other discrepancies, I stopped using it completely.